I took a vacation last week and it wasn’t a travel vacation or even a staycation. It was a preservation vacation, as in I spend quite a bit of my time harvesting and preserving food from our garden. I freeze foods and dehydrate them, but some of my favorites are the foods I pickle. I make a couple of varieties of cucumber pickles as well as pickled okra and a style of pickled jalapeno known as Jalapenos En Escabeche that includes carrots and onions. My next project is to try this pickled tomatillo recipe. When I was child I loved pickles. I even asked for a gallon jar of pickles for my birthday one year. I used to think pickles were an unhealthy indulgence. Now I use pickles to increase my diversity of vegetables throughout the year. Other than watching that we don’t get too much salt or sugar, pickled vegetables are a healthy treat that can help stimulate our digestion. I always make sure I use real apple cider vinegar to get the benefits from it. In additions to the basics like dill, celery, and mustard seeds, other spices that make occasional appearances in my pickles are allspice, caraway, cloves, cumin, coriander, fennel, peppercorns, and turmeric, as well as garlic and chiles. Many of these spices are also good for the digestion, by either stimulating digestion or easing indigestion. I never put alum in my pickles since it is an aluminum product, but my pickles are always crisp. I credit this to the freshness of the produce I use (from my own garden) and soaking my cucumbers in ice water for a few hours before I pack them into the jars. 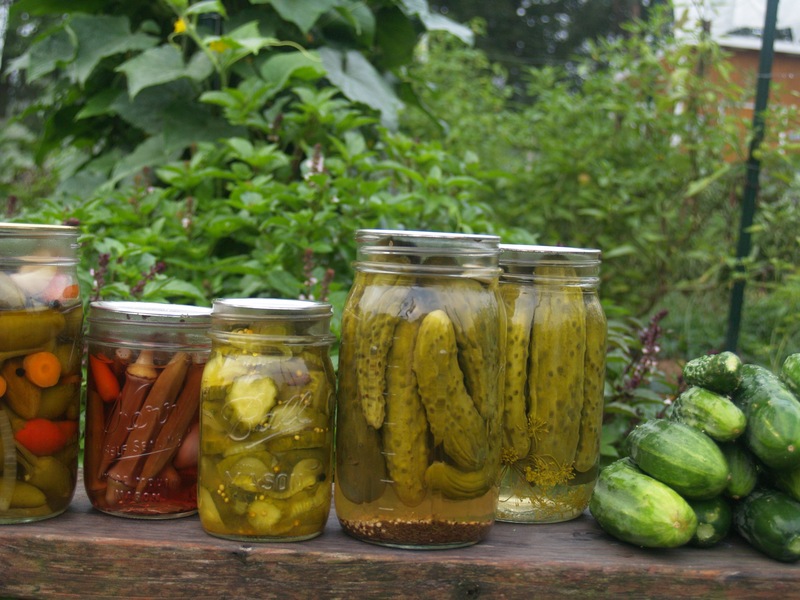 Another option for preserving food is fermentation. If you want recipes of how to make your own fermented vegetables, get a copy of Nourishing Traditions by Sally Fallon or the Art of Fermentation by Sandor Katz. I made a version of the sauerkraut from Sally Fallon’s cookbook, and it was the most awesome sauerkraut I have ever had. Taking the extra effort to preserve foods in the middle of summer’s bounty will ensure the satisfaction of a well-filled pantry throughout the year. Here is a picture of my bountiful cucumber plants, which are doing much better this year with the additional rain we have gotten in the Ozarks. This entry was posted in Health and tagged apple cider vinegar, digestive support, fermentation, fermented foods, food, health, nutrition, pickles. Bookmark the permalink. Do you have a problem with bitter cucumbers? This is my first successful year with growing cukes, but about half of them are bitter. Luckily our chickens don’t mind. Still, I’d like to know how to prevent it from happening! Hi Emily, Great to see you on the blogosphere. 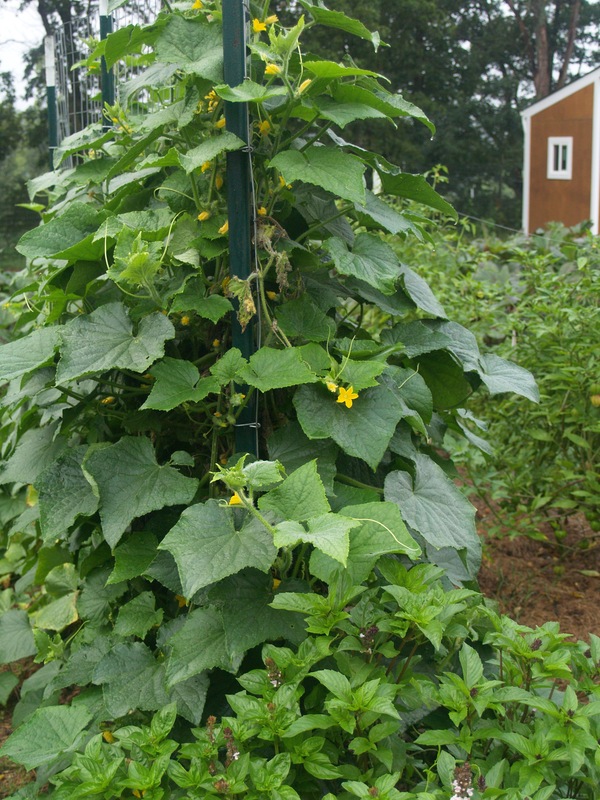 I know other people complaining about bitter cucumbers, and it is generally a case of not enough water. We have been watering ours about every 3 days for quite a while and we have gotten decent rain this year.